Chaco And so, what does it mean? I know what it means to a European, but what does it mean to an Amerind? If one considers that Europeans are linear thinkers and the Amerind circular (iterative) it is highly unlikely that the meanings are the same. The spirals, as are all I’ve seen, seem an after the fact thing. not a prediction but a history, which can be used as a prediction. (since what came around, will again) It’s like they were tracking two somethings and relating them to each other and to the equinoxes and solstices. but what? In the Mayan calendar (wheels within wheels) two of the measurements were 260 days and 365 days. the gestation period is also 260 days, so this system made calculation to figure out the date of birth unnecessary. the spiral patterns appear to just be another visualization of this thought process, but the question remains “what were they tracking?” what is the unknown dimension to this happening? People like to sprinkle pixie dust on something and claim they own it. Any time an anthropologist digs some structure up and they don’t know what it is they call it a temple. 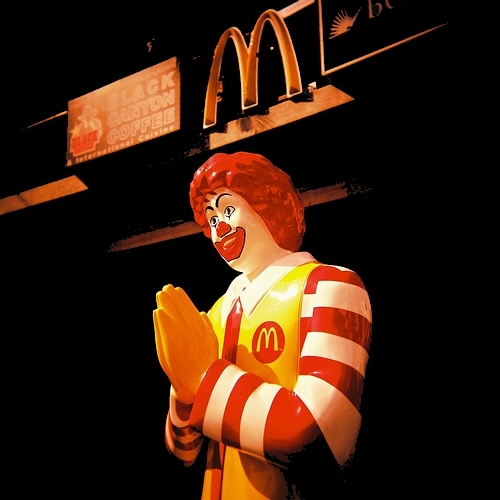 A thousand years from now they will dig up a McDonald’s and proclaim it a temple devoted to Ronald McDonald, with french fries and onion rings as symbolic gifts and the coke dispensers for ablutions. It doesn’t matter what we think of it, the question is what did the Amerind think of it. If a myth, i would like to point out that a myth develops to support an observation, not the other way around. The human mind is wired to make sense of things, even if there’s no sense to be made out of the situation. the platonic solids come to mind. A lot of “sense” there, but so what? they don’t appear to have a relationship to anything except each other. Our minds are wired differently. This entry was posted on August 1, 2010 at 4:10 pm and is filed under Circular with tags amerind, chaco, clock, sun, time. You can follow any responses to this entry through the RSS 2.0 feed. You can leave a response, or trackback from your own site.